I don’t know that it’s possible to make a cuter zombie killer. 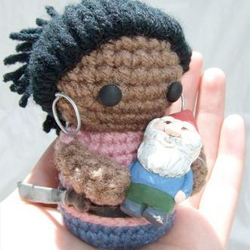 Rinoa1024 made this adorable Rochelle amigurumi and polymer clay Gnome Chompski for a Left 4 Dead themed contest, and won second place! Congrats Rinoa! You can see more great crafts by viewing the Left 4 Dead tag.